Cake Papers used under a fancy dessert! We are so excited about our new collection of pretty paper table runners, place mats and cake serving sheets! Perfect for creating a fabulous look at your summer picnics and bbq’s! These vintage-inspired papers will freshen up the look of traditional doilies. We love the cake serving papers that come in 6″, 8″ and 12″ round sizes perfect for placing on dessert plates (as shown above), under birthday cakes or for larger presentations of sweet treats! 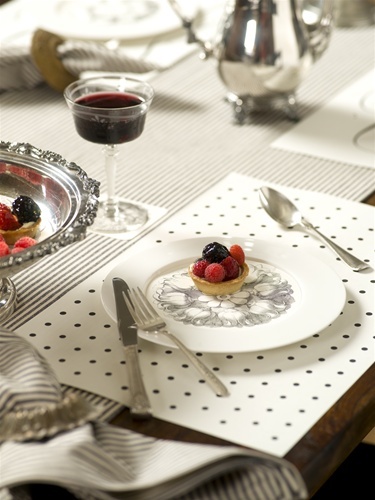 The paper place mats are perfect for sprucing up a BBQ’s, picnic or other informal gathering. The Reversible Cutlery Place Mats come as a set of 25 and are printed on thick and durable heavy craft board (100% recycled!). The charming fork, knife and spoon design is a great way to keep your table looking classy. A matching table runner is a great way to protect your table as well – and it comes in a 50 roll so you can customize it to fit any length of table or even multiple tables! See all of our new vintage paper products HERE and browse our What’s New section for the latest and greatest items we’ve added for summer! This entry was posted in Treat Packaging + Presentation and tagged cake liners, cake plate papers, fancy flours, fancyflours, paper table runner, placemat, placemats, table decor, table runner by Fancy Flours. Bookmark the permalink.